Corporate AV, LLC was started in 2002 on a major downturn in the economy with the intention of bridging the gap between tech jargon and event planners. Corporate AV, LLC felt the AV world had a need for better customer service. 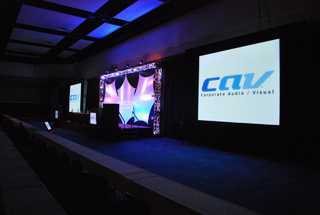 CAV, LLC was put together as the brain child of Daniel Wisholek whom started the company with the very basics needed to put on a small show. In 2010, Corporate AV, LLC has a multimillion dollar state of the art inventory and a staff of 60+ employees. Our clients include some of the major industry tech leaders such as Oracle, Microsoft and Yahoo.